The box is not square. The sides are narrower. This is important to know since the die set includes a piece meant to cut a layering piece to decorate the box. This layering piece can be centered on the front and back, but not on the sides. It would be the same width as the sides, but not the right height. That being said, it would help you get the right shape and you could certainly trim down the pieces by hand so they are the right size for the sides. I would have liked the side layering piece to be included in the set, though. This is where I feel Stampin' Up! something miss the boat in their sets. They include a lot of hearts and stars repeatedly, but not always all the core pieces a set could benefit from. The layering piece leaves a wider border than I expected. This is in part why I decided to stamp my boxes, because the box still felt bare even with the added patterned paper. Personally, I might have prefered a larger piece with a narrower border. Personal taste here, though. To me, a takeout box usually has a handle, and one that can swing up and down. The die set does not include anything handle-related, so I made my own with a decorative border and brads. It makes opening and closing the box a little harder if the handle is up, but that is not a problem when using brads since you can rotate the handle out of the way. 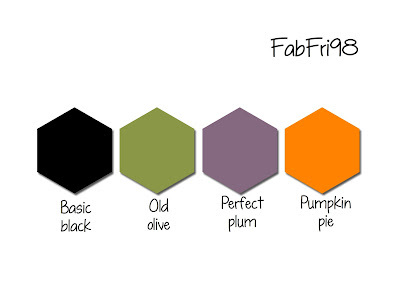 The colour inspiration for those boxes was the MFT Color Challenge #99 (Crumb Cake + Tango Tangerine + Basic Black + Going Grey). Based on the sixe of the boxes and the colors, I think I could slip a small Reese's Cup inside as a treat. I wound up with two boxes because I hesitated between two cardstock colors and cut out two boxes before deciding on the grey one. I figured I would use the kraft one for a Christmas box but as I was working on the first box, ideas kept coming and I already knew what I could do to decorate the second one, so I kept going. I'd like to give candy boxes to colleagues at work again this year and I always prefer to work on it over a few months rather than do assembly-line work all at once (which takes all of the fun away from it for me, since I like creating and despise repeating). So two down and 2½ months to go to work on the rest. To include the kraft colour on the first box, I stamped and colored my images on Crumb Cake cardstock using Prismacolor pencils. My pencil coloring keeps improving and the images turned out pretty cute. I didn't have the matching dies last year when I bought the stamp set since they were always selling out but I managed to put my hands on them since, so I was able to cut the small images out neatly. I hung the spider from a piece of black twine and glued the end of the twine inside the box using a piece of grey washi tape. The handle was made using the Mini Provincial Impresslits from Tim Holtz. I used the new Joyous Noel Glimmer paper from the Holidays catalogue but I spaced out on the fact that I had to be mindful of which side of the paper I was putting face down in the Impresslits. The embossing ended up on the white wide instead of the sparkly one. Not to worry, I used a blending tool and my Ripe Persimmon Distress Oxide ink to turn the white backside to orange. The sparkly side of the handle is still showing, so that's a fun little surprise. The same paper was used to add a punched star to the top of the second takeout box. The Takeout die set includes a little banner with fold lines on it to give it dimension. (Going back to my previous comment, the just retired Popcorn Box die set had the exact same die in it, but I guess you have to repeat some pieces to replace the retired ones.) I had a look at which Halloween sentiments I had that could fit between the two lines and spotted what I needed in the Frightful Friends stamp set. The first one reads, "Love You to Death" and I paired it with the tombstone image. The second one reads "Happy Haunting" and it goes well with the cemetary theme, with all three other sides decorated with tombstones from the Grave Situation stamp set. When I made the second box, I was running a little low on coloring steam and I didn't feel like going back to my Prismacolor pencils again, so I stamped the images directly on grey cardstock and just did very simple shading using Smoky Slate and Basic Black Stampin' Blends. Sometimes, it doesn't have to be fancy to be cute. You can see based on the size of my fingers how tiny the takeout box is! I'm working on a few last-minute treat boxes. I reached for the adorable mini-pizza boxes again. They take to ink really well, they're easy to assemble and they're roomy enough to accomodate nice-sized treats. I got the idea to use the How You Bean? Candy Corn Add-On stamp set for the top of this one. I had some glitter paper sitting on my desk, so I used some to mat the image in black glitter, and for the background behind the candy corn image, I had the idea of creating a word background by stamping the "candy corn" sentiment repeatedly in Daffodil Delight, Tango Tangerine and Smoky Slate. It turned out pretty cool! The box itself was inked with Seedless Preserves Distress Oxide ink and spritzed with water to create a mottled effect. Tango Tangerine trim was added around the box. I want to bring Halloween treats for colleagues at work, so I pulled out some Halloween papers from a few years ago (Motley Monsters) and put together those two cute gable boxes using the Scalloped Treat Box die from Lawn Fawn. The reason I ended up with two boxes was because I apparently couldn't figure out how to die the two parts from the right side of the paper in order to get the same pattern on both parts!! I wanted the polka dots (the back has ghosts), so I cut a third piece to finish the first box. I was torn between the idea of doing a silhouette background with last year's Halloween dies or to handcut cute monsters from the Designer Series Paper. In the end, because I had a spare box piece, I decided to do both. The silhouettes were die-cut with the Halloween Scene Edgelits out of patterned paper and cardstock. The cute pumpkins were handcut from one of the sheets of DSP. When I cut the fourth piece to finis the second box, I somehow messed up again. I got frustrated and instead of wasting good paper, I cut the two sides out of the die-cut I had, leaving a little tab to add them to the bottom. (Usually, you just overlap the two bottoms together.) That worked out just fine and it salvaged what I already had. I die-cut two dotted scallop rectangles for each sides and added some handcut monsters. I did the same thing on the two other box sides, without the rectangles. I stamped "Taste at your own risks" on the front. 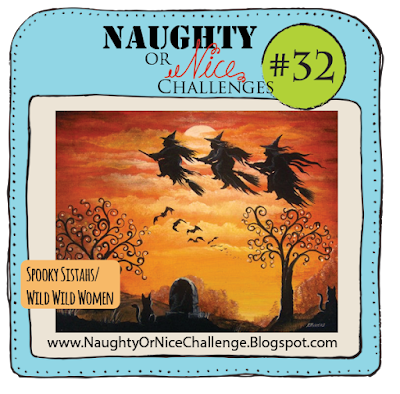 Those treat boxes were inspired by a few Halloween challenges online this week: Simon Says Stamp Wednesday, Hand Stamped Sentiments #275 and Naughty or Nice #44 (Spooky). This project was inspired by Naughty or Nice #44. To make the panels on each side of the milk carton, I stamped on cardstock with a clear block inked with various shades of Distress Oxide ink. I let the ink dry and I handcut each rectangle. I added a bit of stamping on each of them using the same ink and the Fab-BOO-lous stamp set. I had picked shades that matched the BooVille papers from Doodlebug Design, but when came time to die-cut the milk carton, I realized that I needed a piece of paper bigger than 6X6, so I cut two sheets together before running through the Big Shot. The little ghosts were stamped in Tuxedo Black Memento ink and colored with markers, than handcut and popped up on Dimensionals. I popped two fun-sized candy bars in there then punched holes with my Crop-a-Dile before tying the carton shut with two pieces of purple fiber. (Those were sold by Making Memories back when I started scrapbooking and they've been in my stash forever.) Finally, I had some sequins that had been die-cut out of Champagne foil paper leftover from another project that I glued on each side of the milk carton. I started this project ages ago, back when I found some of the Village Dwelling dies on sale at my local store. I added the Village Manor die to my collection to go with it and immediately started putting a manor together because the die was so new, I could barely find any pictures of finished projects online or videos showing how to assemble it. I have to say, the diagrams on the back of the packaging don't provide a whole lot of explanations, so you have to figure out a lot of the steps on your own. One of those steps was how to assemble the top of the tower on the house. It sits on the tower but gets crooked if you don't glue it in place. I got a little frustrated, plus I had to clean up my craft room so I put the project aside and pretty much forgot about it. That is, until my niece visited, found the box with the pieces and asked why the house was not finished. She asked again when she visited later as it still was sitting unfinished in the box. After that second time she asked, I pulled the box out and put it near my desk to remember to finish it. So when I saw the Simon Says Stamp challenge (Anything Goes), I spotted the house and decided to give it another shot. I used copper Nuvo crystal drops to make my door handles at the front. I stamped the door, the front part of the house and the porch with stamps from Gorgeous Grunge and Timeless Textures to give the cardstock a bit of dimension. I added vellum behind the windows so that we could not see inside the house (neater finish). See those little spiked on the rooftop? It's the top of the fence die. I used Copper Foil Paper so that it looked like it was made out of metal and the result if pretty cool. I found some textured paper at a local store (really thin, almost like crepe paper) and I added it to sturdier cardstock to make the roof. It totally changes the look of the finished house. For the walls, I used a crackled-paint patterned cardstock from Tim Holtz. You'll notice I added a few bricks around the house. They're the inside of the die-cut window frames that I reused! The mini pizza box, as adorable as they were, didn't make it on my first Holidays Catalogue order. I got them later and before receiving my order, I saw a project online where a stamper had used the new snowflake embossing folder on the cover. Not having seen the boxes yet, I was a little confused about how that could be done. (And the project was done by a German stamper, which didn't help me understand the details of how that had been done.) Once I received the boxes and realized that they come flat and unassembled, I could see how they could be run through the Big Shot. I will warn you, though: they're made of sturdy cardstock so using the regular Big Shot sandwich for embossing folder is not an option there. I had to pull out many options of various shims before I managed to figure out something that did emboss the cover. I had Halloween candy packaging in mind, so I gave embossing a try with the retired Spiderweb embossing folder. I didn't want to leave the box stark white and I was first planning on using patterned papers, but then I got curious to see if the Distress Oxide inks would work well on the boxes. The answer is: they do!! Based off of an old ColourQ combo (#314), I combined Spiced Marmalade, Seedless Preserves and Peeled Paint on the box. Then I decided to add a Happy Halloween sentiment to the box, but found "Surprise!" in a new French stamp set I have, so I went with that instead. A piece of polka dot grosgrain ribbon was added arond the box. This project was not supposed to be complicated. I planned on doing a watercolor wash of an Halloween scene and layer the awesome new Detailed Gate Thinlits die-cut, which would do most of the work to make the project interesting since it's so intricate. Although the project started that way (as a card), inspiration kept coming faster than I could put the project together, and I finally ended up with a treat box! Most of the images used were pulled from the Graveyard Gate, which is the stamp set offered in a bundle along with the Thinlits dies. 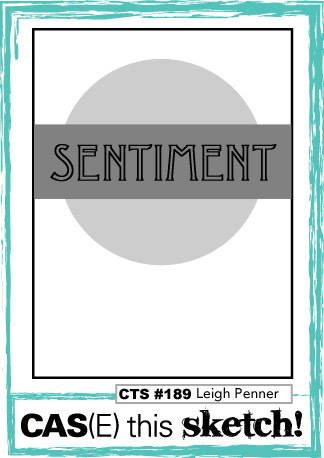 I did reach for the Snowflake Sentiments bundle as well, though (which sounds counterintuitive for a Halloween project). I was looking for a way to hang a little sign on the gate with the "Open if you dare" sentiment and I spotted in the Swirly Snowflakes Thinlits a mini tag, so I decided to use that instead, and I used the matching stamp set to stamp "for:" inside the tag. I lined the inside of the tag with Designer Series Paper, by running the die through the Big Shot a second time with the DSP and cutting the tag in half, keeping only the inside portion. When I added the gate to my project, I thought there might be a way to slide a lollipop or something underneath the gate (an idea to be explored later). Instead, I decided to create a pocket on the back of my scene - that's when the card turned into packaging. I was exploring ideas and finally decided to create a box bottom out of Tango Tangerine cardstock based on a sketch for measurements. 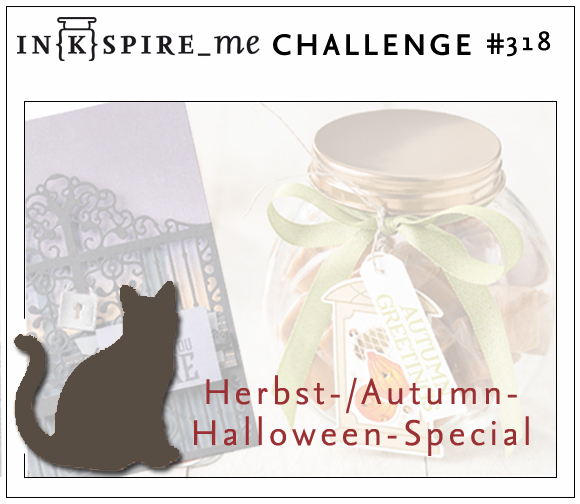 I drew inspiration for the colour combo from an old ColourQ challenge (#311) and In[k]spire Me challenge #318. I'm so stocked about how this one turned out, especially since I wasn't envisioning something so intricate when I first started crafting. I found some stamped images I had received years ago in a swap. The pile contained some really cute stuff, including some cute Stampendous Halloween images. I sat down and started coloring them with Prismacolor pencils, thinking I could make a card with them. Then the card became a Halloween treat bag after spotting a kraft bag I had left out on my desk, hoping to find a use for it. Then, as I was trying to find design that would work, I thought I could do a house backdrop using the Little Town Border die from Lawn Fawn. That's when the ideas started coming and I found myself turning the whole thing into a little scene. This was inspired by In[k]spite Me challenge #318. I found those lovely gumballs at my local Bulk Barn and thought if I got some orange, yellow and white ones, that I could slip them in the mini test tubes Stampin' Up! is currently selling in the color order of candy corn for a fun look. Well, I got home and gave it a try... only to discover that they're a really tight squeeze and that I had to push them down the tube. I suspect once they're down that the will not come back up, so that idea went out the window. I decided to give the clear treat box a try instead and it worked out better. I was keen on matching the cute box with the How You Bean? Candy Corn Add-On stamp set from Lawn Fawn, so I created a little tag out of the grey Bazzill cardstock I had leftover from my last project, using the tag topper punch Stampin' Up! used to carry. I used the Spooky Cat stamp set to add "Happy Halloween" underneath. I tied Pumpkin Pie chevron ribbon around the clear box and tied the tag on it using grey and black twine (last year's Halloween Night Baker's Twine). 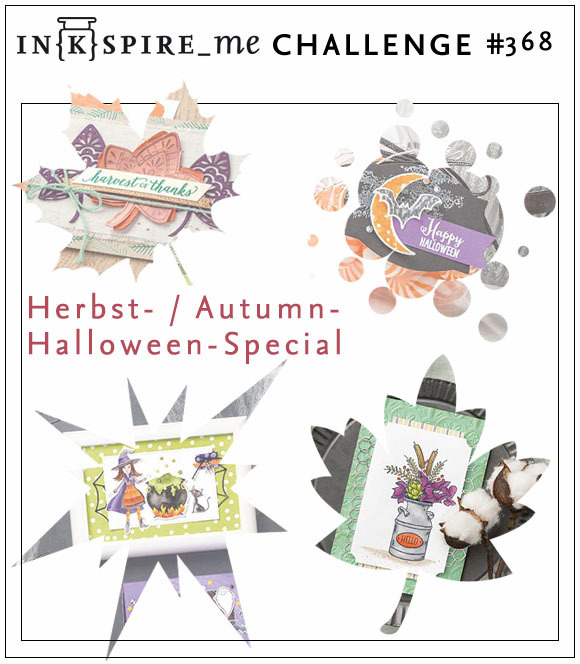 This fun candy packaging was inspired by the In[k]spire Me challenge #318 (Halloween and Harvest theme) and Lawn Fawnatics #13. I'm still playing with the new 2017 Holidays Catalogue release. This treat bag showcases the Spooky Cat stamp set. The images are fun, but the French sentiments are even more awesome, so this one was a no-brainer for me. I really like the little potions included in the set, and the crooked witch hat (shown here). I used the Foil Frenzy Specialty Designer Series Paper again. It's hard not to get addicted, especially when making projects for festive occasions. The black rhinestones are also a new embellishment from the Holidays Catalogue. I predict those will be popular. The treat bag was created with the Gift Bag Punch Board. I'm getting better at using this thing without having to read the instructions one line at a time! The Lawn Fawn new release includes some die-cuts to turn the Scalloped Treat Box into Christmas or Halloween houses. While I didn't get the dies, I was curious to give the idea a try. I already have the Home Sweet Home Thinlits from Stampin' Up! which I suspected might work, size-wise, and sure enough they do. The only difficulty is that the roofing pieces are meant for a narrower house base, so I had to be creative with assembly to make it work. It called for an awful lot of Big Shot'ing and figuring out how to cut the pieces apart to keep the flow even in the roofing pattern. That's where the Lawn Fawn dies would have saved me a lot of time (say, if I was to make a series of those to give out), but for this one, the piecing worked great. I was putting vellum behind the windows and before doing the same behind the door, I decided I would have the little witch peeking behind the door with her candy bowl, so I stamped, colored and die-cut her to glue in the door opening before adding vellum behind her. The bowl is peeking out, which is a cute way to draw the trick or treaters in. I also added her broom sitting against the window frame. Then I thought I could add her cat as well and pulled out Meow You Doin'? but the image was too big to be scaled properly. Then I remembered that Christmas Dreams as a sleeping cat as well, and this one was the perfect size! It looked a bit crowded on the front, so I added it to the side of the house, and placed a Jack o' lantern on the back. A enamel dot was glued as a door handle. See those cute bricks I've added here and there? They're the leftover pieces from cutting the window frames. Recycling and adding fun details! Finally, a tag was added to the house using the Fall Tiny Tags dies (another item from the new release). I tied it with grey and black twine and made sure to wrap the twine only around the front handle so that the box can be opened without unfastening the twine. The sentiment reads, "Eat at your own risk." Kelly Marie showed how the Scalloped Treat Box can hold two electric tea lights so that you can light the house. I'll definitely give this idea a try if I can find where I've put my tea lights away! I used the Ready to Pop stamp set to decorate the bags, and the Brushstroke Alphabet to personalize each box. This stamp set can be found in the annual catalogue and it's a great size and font to embellish 3D projects, Project Life pages or even make your own sentiments on cards. The top of the cello bags was scealed using Pumpkin Pie chevron washi tape. The tags were hung from the box using the Halloween Night baker's twine (current Holidays catalogue). I love that baker's twine - it's woven tightly and the two colors do not come apart. Great quality in cute colours! The cute plastic trey I set the boxes on was found at Michael's, in the Halloween section. This project was also inspired by this week's Wednesday Simon Says Stamp challenge (Anything Goes). The theme was inspired by a Falliday Fest challenge, but I also drew from Stamp Ink Paper challenge #70, ColourQ #364, Naughty or Nice #32 and Hand Stamped Sentiments #249. I wanted to pull out an old Stampin' Up! stamp set that I always have fun revisiting, Greeting Card Kids. I used the witch and used some Halloween supplies with her, but I wanted to turn the card into something that could be used for an October birthday. To do that, I used the sentiment "Make a Wish" from the Oh Happy Day card kit. I think the "wish" ties in with both the witch and a birthday. I've used the Halloween Night Baker's Twine sold in the current Holidays Catalogue to tie a bow at the top of the card. The purple cardstock was embellished with sponged ink using one of the Seasonal Decorative masks (also from current Holidays Catalogue). My main image was colored with good ol' Prismacolor pencils (that I have from my school years). On a side note, I used Shimmery White cardstock from Stampin' Up! to stamp and color my image and it works exceptionally well to move the color around. I've had this cardstock pack for years and I used to use this cardstock only when I wanted something shimmery on my project, and when we came out with the glimmer paper and foil sheets, it quickly took a backseat. Recently, Stampin' Up! pointed out to everyone that this cardstock was great for watercoloring, so I've given it a try and I can't help but wonder why it took so long for this information to circulate! I'm going to use it way more now that I know about that and I think SU! would have sold more over the years if people had known how great of a coloring medium it really is. 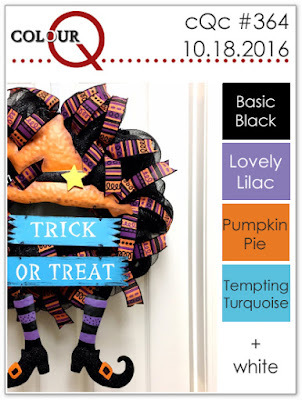 Inspired by Falliday Fest challenges (on Splitcoast Stampers) and Fab Friday challenge #98, I put together this Halloween candy holder. I pulled out some retired Halloween DSP and retired Spooky Bingo Bits stamp set. The idea started with some old waffle paper from SU! I found in my stash. I still have quite a bit of the roll left because I've always struggled to find ideas on how to use it properly. Then I got the idea of making a candy wrapper and having the waffle paper come out at both edges. While my idea worked out perfectly, when came time to check this project on my Falliday challenge sheet, I noticed the project called for a card! Not a 3D project. Phooey! Thankfully, my work is not lost because this candy holder will fit in another category, but it's back to the drawing board for the first challenge. The cute enamel dots used to embellish the candy holder are the Halloween Night Enamel Dots found on page 51 of the 2016 Holidays Catalogue. Eat Popcorn at Your Own Risk! Halloween's coming up and it was the challenge theme at Simon Says Stamp this week. I'm always up for Halloween crafting since it's my favorite holiday to craft for right after Christmas­. 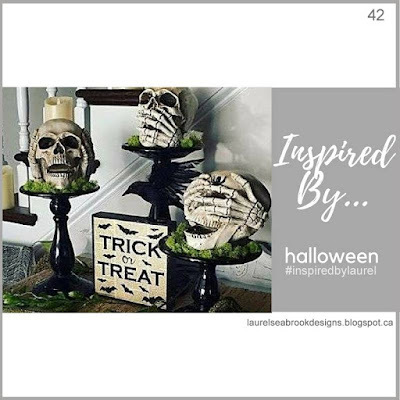 I had spotted some Halloween popcorn at my local Bulk Barn store, which is the perfect treat to pair with the Popcorn Box Thinlits Stampin' Up! carries. I pulled out some Halloween papers from my stash and put together three matching containers. (I'm thinking those will go to my sister, brother-in-law and niece). 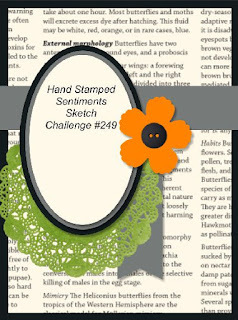 Looking at the CAS(E) This Sketch challenge #189 made me think of the Spiderwebs doilies Stampin' Up! was carrying last year. I have recently pulled a few Halloween items out of my stash to start making some seasonal projects ready, and those doilies were part of the bunch. With that in mind, I decided to go for a treat bag instead of a card, so I pulled out some square vellum envelopes I have and embossed one with the Brick Wall embossing folder. I then embossed a sentiment from the Seasonal Sayings stamp set (retired) in black powder, and added Doodlebug die-cuts that were recently purchased. I couldn't wait to try the Home Sweet Home Thinlits dies and see how the little house looked in person. I decided to start with a Halloween house since this will be the next Holiday coming up - and since it gave me the chance to use the new Pumpkin Pie glimmer paper as well (love!). I got the idea to use the corrugated paper we used to carry in the last annual catalogue. The Thinlits didn't cut all the way through it because of the thickness, but they left a clear enough impression for me to just go over with scissors and cut the sides out. I made sure to cut apart all four sides and glue them on a house base I cut out of regular cardstock. The corrugated cardstock would have been too thick to use as the base of the house itself. It wouldn't have folded nicely and would have been too bulky to use as tabs to assemble. Also, because the corrugated paper was so thick, I wasn't able to cut windows all the way through, so I just did the overlays and placed vellum cardstock underneath for a frosted window look. Along with the new Pumpkin Pie glimmer paper, I pulled out the Black glimmer paper as well from last year. I'm not sure why SU! didn't continue carrying this one, as it is absolutely gorgeous. I used it along with the Layering Squares Framelits to create a base for my house. It's both decorative and also stabilizes the base of the house. On the back, I used some of the stamps from the coordinating stamp set (sold with the Thinlits at 10% as a bundle), Sweet Home. For the little pennant banner, I pulled out the Labeler Alphabet stamp set to add the word "Boo!" on it. I die-cut the shingles on the roof out of Pumpkin Pie glimmer paper. I needed four shingle strip for each side of the roof. I'm submitting this project to the Stampin' Royalty challenge gallery #340. While my Seasonal Snapshots Project Life cards were out and I was on a roll, I made a two-page layours showcasing pictures of my colleagues in costume at the office. Everyone went all out that year, decorating their offices, putting on costumes, wigs, makeup... I was definitely impressed! As well as using the Seasonal Snapshots cards, I also used a couple of overlays from the Specialty Memories in the Making Project Life Cards pack that was available during Sale-a-A-Bration this year. One was added to my top picture on the left page, the other one I used to emboss a sentiment on with Tango Tangerine embossing powder, and I layered it over a piece of Core'dinations cardstock I embossed and sanded to make the little stars stand out. I then handcut the little monsters from the Seasonal Snapshots card and added them on top of the overlay. I also added a googly eye to one of the monsters. I used White StazOn ink of add sentiments directly on pictures ("trick of treat" on the witches picture, "Howdy" on the cowboy picture and "Ahoy, matey" on the pirate picture). I mixed and match a bunch of various Halloween sets I've acquired through the years and accented my various PL cards. The tomb from Graveyard Gala was used to add the date, and I die-cut the numbers out of Black Glimmer Paper. I also pierced holes around the printed circle on one of the cards and handstitched around it using needlework floss, then I added three Designer Buttons. Lots of fun little details to make the whole layout more interesting! My friend Maggie invited me over to her place for a night of scrapbooking. This is the first page I put together while we were crafting. I had one picture too many for a single-page layout, so I used a spare pocket and the fuse tool to add a picture to my page. You can see the picture with the flap closed in the first picture, and the flap opened in the second picture. I used the backside to add additional journaling. While I was at Maggie's, I used the opportunity to borrow some of her Halloween and alphabet stamps that I don't own myself. The pictures show our Halloween decorations at the office a few years back. The accounting department had decided to decorate and do a friendly competition between the various teams. Timing wasn't good for the financial information team, since Halloween fell just a couple of weeks before the financial statements filing, so I found this neat idea on Pinterest of an abandoned house with planks in front of the windows, so I cut boxes apart and added nails with a Sharpie marker to put on the windows of our offices. Seems simple enough, but when you have seven offices to decorate, it really adds up! It looked really cool, though, so it was worth the time and effort. I had more candy to wrap, so I made a few more Halloween boxes this week. They appeared to brighten people's day when I distributed them at the office. You've seen me use these little boxes on a past Halloween project recently, and I was worried I wouldn't be able to fit anything in there except maybe a lollipop or something, but the Reese's Pieces solved that problem. With that in mind, I decorated a second box. I've been trying out the Tear & Tape Adhesive Stampin' Up! added to its line this year and I'm very happy with the results so far. The tape has great hold but is also really easy and quick to use since you can just tear it up instead of using scissors. The protective liner is also really easy to grab hold of and pull off, which is not always the case with tape that kind of adhesive. Check it out on page 156 of the Annual Catalogue. At $8.50 (CAD) for 25 m, it's a great deal. I got the Mini Purse Bigz Die when it became available on a catalogue preorder years ago... and then proceeded to use it once, discover just how shockingly small it was, and then it gathered dust ever since. Last Friday, I went to Bulk Barn to buy Halloween treats to prepare some Halloween packages for the office and got, among other things, Reese's Pieces. As I was looking through my dies, I thought the purse might actually work nicely for that candy and sure enough, you can fit quite a big chunk in there, so based off of Just Us Girls challenge colours (#315), I created those little purses using some adorable Doodlebug Designs papers. Looking at the CAS(E) This Sketch #145, I thought I could stamp an Halloween sentiment repeatedly and then pop a little pumpkin on the side to mimick the sketch. The colour scheme came from the Fab Friday challenge #75. A little bit of piercing using the piercing templates and a black satin ribbon complete the card. 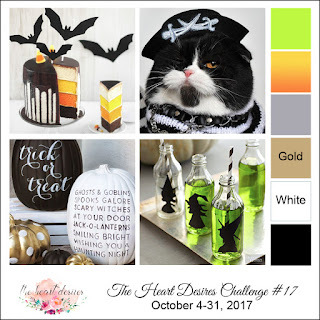 ColourQ challenge #312 inspired a new Halloween treat package project. I looked through my Big Shot dies and decided to pull out the Petal Cone, which I hadn't used recently. This project came quickly together, using leftover pieces from the Pick Your Poison paper pack and quick accents. I just received the 2015 Holidays Catalogue Hostess set called Six Sayings and wanted to make a card to welcome new recruits to my downline using the "Enchanted" sentiment. Since it's quite big, I was looking at sketches that could work with it and when I saw the CAS(E) This Sketch #144, I knew I could stamp the sentiment on patterned paper and add little bats in lieu of papillon. I used the polka dot paper from the Happy Haunting Designer Paper Pack and when I saw the orange polka dots, I knew I could do a neutral card that worked for the Colour Me Challenge #92 as well. All I did to decorate the card was add a punched banner at top and a handdrawn black border around the paper, using a Basic Black Stampin' Write marker. Simple, but adorable. 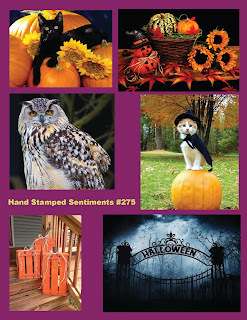 The little bat comes from the Project Life Seasonal Snapshots 2015 stamp set. I've been using this little image a bunch already. I was so happy with my Basic Grey Archival ink pad that I decided to splurge on the Basic Black as well (even though I love and use the Tuxedo Black Memento ink pad all the time). This is what I used to stamp the sentiment and bat. Be warned that the archival ink really stains stamps, but it doesn't affect their use. You can see by the little bat I stamped in orange on the envelope that the ink doesn't transfer to other colours of ink, even if the stamp remains stained. Another one of my World Cardmaking Day challenge was to create packaging for an upcoming Holiday. I chose Halloween and pulled out the Berry Basket Bigz L Die. I like how it looks paired with the Happy Haunting Designer Series Paper, which happened to fit with another one of my challenges, which was to use our favorite DSP. This one is my current favorite. The patterns are all really cool and modern and offer a grown-up take on Halloween, which I appreciate. I used the Project Life Seasonal Snapshots 2015 stamp set (can't keep this one away) for the front and also to stamp two bats to add to the basket handle. I punched two circles out of the polka dot paper and used the googly eyes we used to carry a year or two ago. To create the scalloping on the handle, I simply die-cut the scallop border twice and lined up the pattern when gluing them down on a larger strip of Basic Black cardstock. I used the Fringe Scissors to add straw inside the basket. The sentiment was stamped on Very Vanilla cardstock and punched with the 1-3/4" Circle Punch. I handcut the center of a Spiderweb Doily and matted the stamped image with it. I lined up the back of the doily with a piece of Tangelo Twist cardstock punched with the 2" Circle Punch. At the bottom, I used the openings in the basket to thread a piece of Tangelo Twist Satin Ribbon (now retired, but available while supplies last in the Clearance Rack of SU! 's online store) and tied it in a bow. The remaining of my punched gold glimmer stars were added with the Precision Glue to the sentiment block. Silver Cording Trim was wrapped around the handle and tied in each corners of the basket. I hadn't used my Box Punch Board in a while and decided to pull it out to make some more Halloween packaging. I paired them with some cool gold foil Halloween papers I found at a local store, and pulled out a retired set called Wicked Cool. The design at the front of the box was based off of Sweet Sunday Sketch #288.